If you have hearing loss, you may not be aware of it, especially if it has happened over time. Your family members or friends may notice that you’re having trouble understanding what others are saying. Hearing loss is the third most common health related problem in the United States. It is estimated that 28 million Americans have a hearing loss. Of those who have a hearing loss only six million have pursued hearing help and approximately 700,000 of those have a severe to profound hearing loss. If your doctor thinks that you have hearing loss, he or she will do hearing tests to check whether you have hearing loss and find out how severe it is. You may be referred to an audiologist to do the tests. There are three different types of hearing loss depending on the location of the disease within the ear. A conductive hearing loss results when a problem originates with the outer ear or middle ear and prevents or impedes sound from being conducted to the inner ear. A conductive hearing loss can stem from an abnormality of development, such as the absence or incomplete formation of a part of the external or middle ear system. The problem can also be caused by disease within the external ear or the middle ear such as severe and continuous otitis media (inflammation of the middle ear often accompanied by fluid buildup). This type of hearing loss can generally be corrected by medical or surgical means so that hearing is restored. A sensorineural hearing loss results from an abnormality of development or disease affecting the cochlea or auditory nerve. The cochlea is the organ that converts sound waves to electrical energy. The auditory nerve transmits the sound stimuli in the form of electrical impulses to the auditory center of the brain. 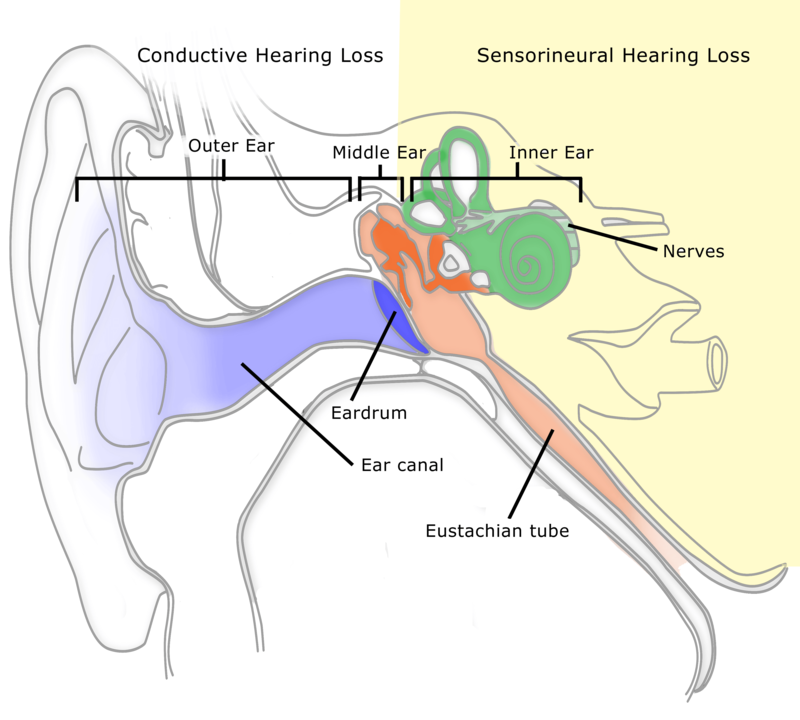 In general, sensorineural hearing loss cannot be treated by current medical or surgical techniques because there is permanent damage to the inner or auditory nerve. 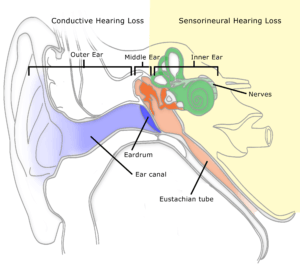 A mixed hearing loss involves both a sensorineural and conductive component. The conductive part of a mixed loss may be treated by medical or surgical means, depending on the type of disease present and the percentage of the total hearing loss it may represent. Treatment depends on the type and source of hearing loss. Surgery may reverse hearing loss caused by otosclerosis, scar tissue, or infection while Ménière’s disease is sometimes treatable with medication and diet modification. Hearing loss caused by infection can often be treated with antibiotics. If you think your hearing loss stems from medication use, talk with your doctor about alternative drug options. Prompt medical treatment for sudden hearing loss may increase the chance of recovery. People with permanent hearing loss need to learn how to function with the hearing they still have. Most people with permanent hearing loss can benefit from using a hearing aid — yet only one in five eligible people use them. Hearing aids are tiny instruments you typically wear in or behind your ear that make sounds louder. Things do sound different through a hearing aid, so it’s important to talk with your doctor to set realistic goals. Other sound-enhancing technologies include personal listening systems that allow you to tune in to what you want to hear and mute other sounds. TV-listening systems make it possible for you to hear the television or radio without turning the volume way up. Different kinds of phone-amplifying devices are available to make conversations possible on home and mobile phones. Finally cochlear implants are used mainly with young children but are becoming more popular among older adults with profound hearing loss. Make sure they have your attention before they start talking. Make sure you can see their lips moving when they talk. Speak clearly but don’t shout. With so many untreatable cases of hearing loss, prevention is your best ticket to healthy long-term hearing. Wear earplugs when you’re exposed to sounds as loud or louder than traffic. Lawn mowers, power sanders, vacuums, and most concerts are all loud enough to harm unprotected ears. When possible, move away from the source of the noise. For example, cross the street or cover your ears when you walk past a loud road construction site. If you work in a noisy workplace, talk to your employer about ear safety. The National Institute for Occupational Safety and Health (NIOSH) recommends that employers in noisy plants install barrier walls or mufflers to protect their workers’ hearing. Hearing loss is often permanent, so do what you can to protect one of your most valuable natural assets.